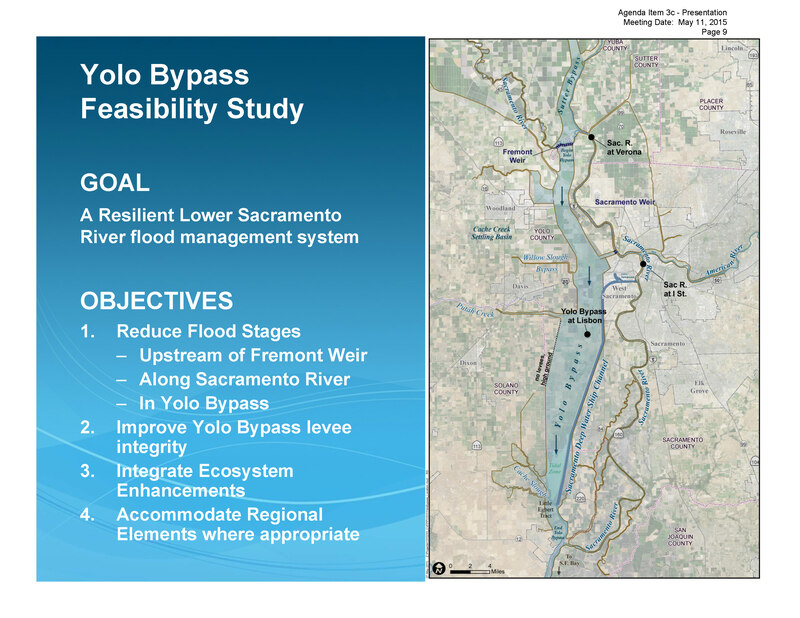 In between Sacramento and Davis lies the Yolo Bypass, a narrow strip of land that finds itself in the crosshairs of federal, state, and local interests and multiple projects that seek to integrate agriculture, wildlife benefits, and public access, all while maintaining the bypass’ critical function of flood protection for Sacramento. 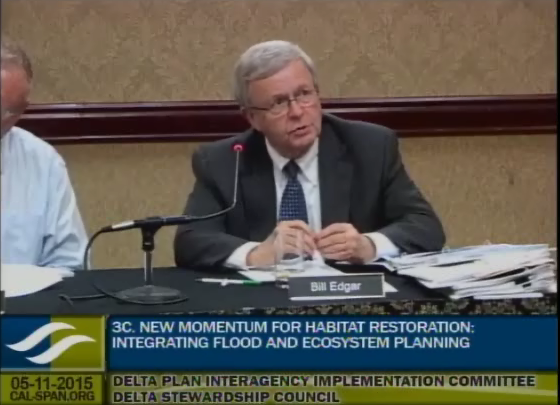 At their November 2014 meeting, Delta Plan Interagency Implementation Committee members heard about the integration efforts underway; at the May meeting, committee members received an update on the progress made since then. 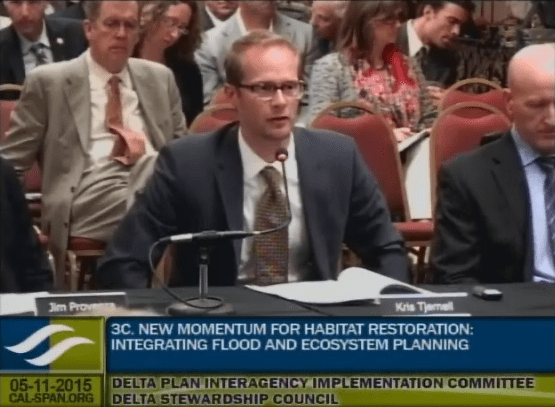 Kristopher Tjernell began by giving his appreciation for the Committee’s continued to coming up with strategies and collaborative efforts to pursue the coequal goals for the Delta, and in particular, for fostering a dialog in which we can discuss how the Yolo Bypass itself plays a role in the achievement of the coequal goals. 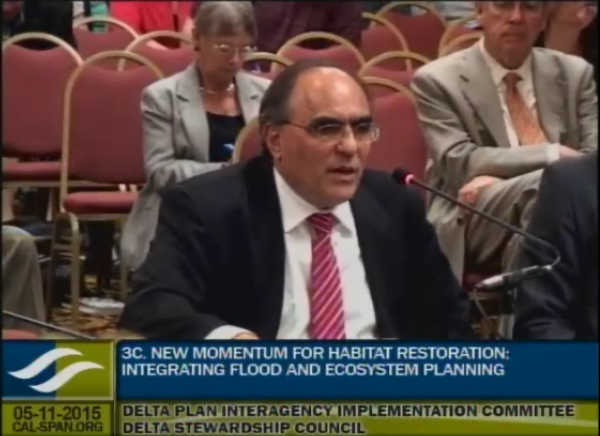 He noted that in all the topics discussed today, there’s been a common theme of collaboration and working across agencies. 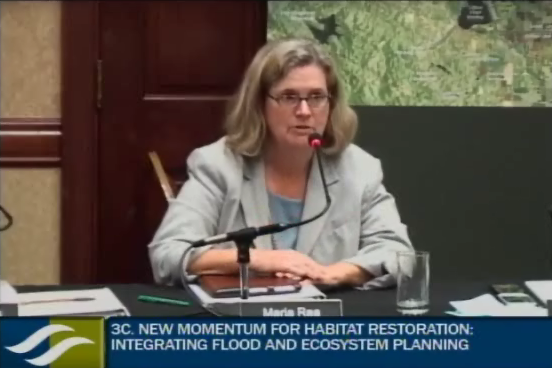 “So I think that what you’re about to hear, the issue is exactly the same, and just a different context, but the value of that type of collaborative effort rings true here as well,” he said. 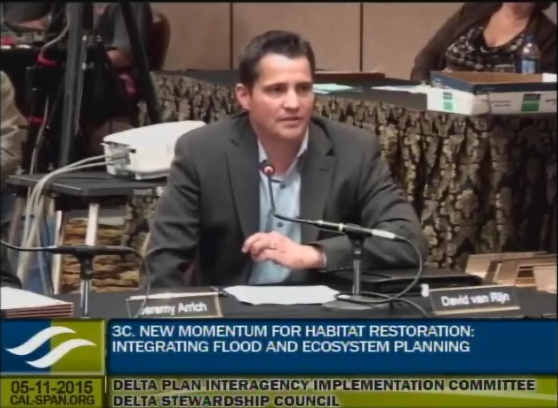 He then introduced his panelists: David van Rijn with the Bureau of Reclamation, Jeremy Arrich with Department of Water Resources, Division of Flood Management, and Yolo County Supervisor Jim Provenza. 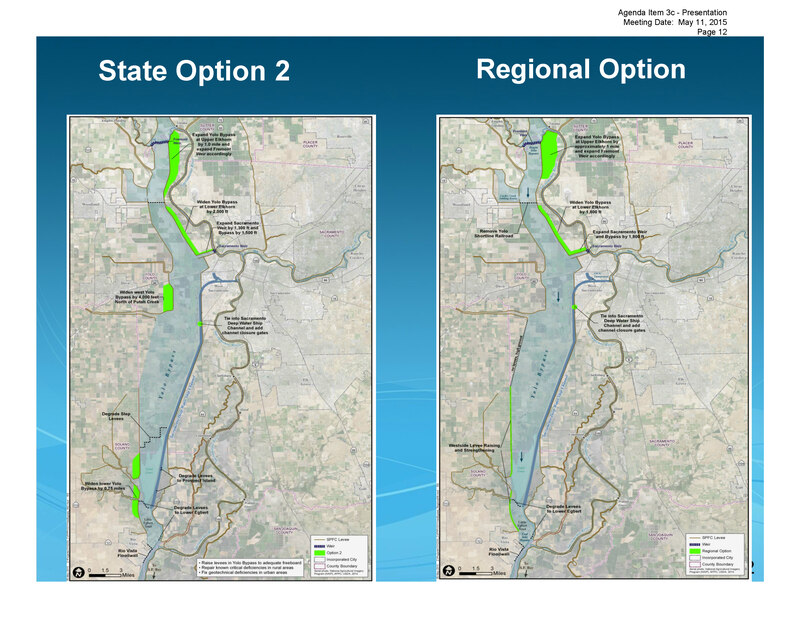 David van Rijn began by saying he would be talking about the Yolo Bypass Salmon Habitat Restoration and Fish Passage Project that the Bureau of Reclamation and DWR is currently undertaking as part of the requirements of the NMFS 2009 biological opinion. 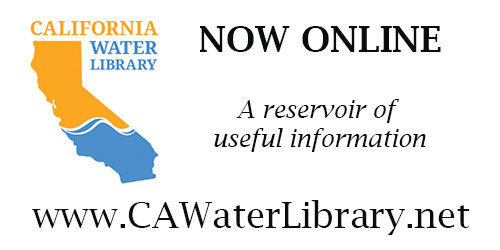 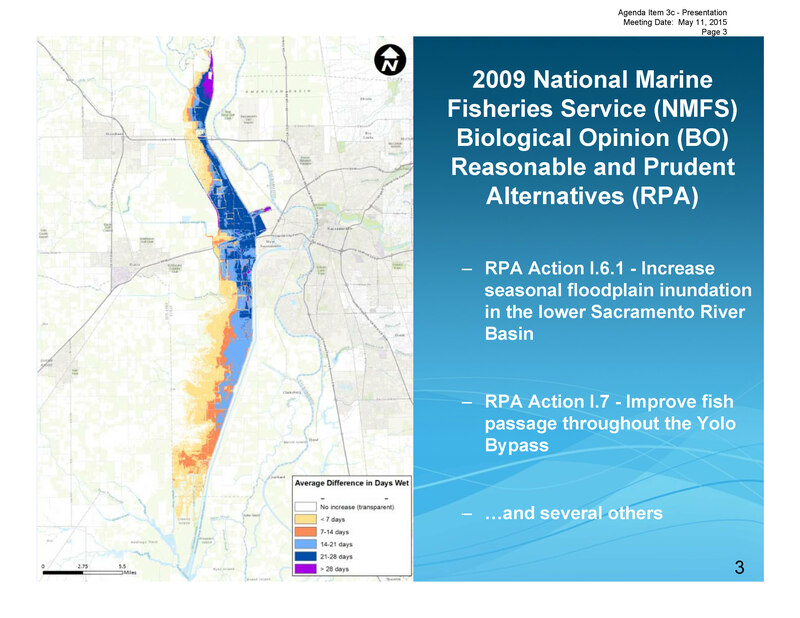 The biological opinions require a number of Reasonable and Prudent Actions (RPA); this project deals specifically with RPA Action 1.6.1 to increase seasonal floodplain inundation in the Lower Sacramento River basin, and RPA Action 1.7, to improve fish passage throughout the Yolo Bypass, and specifically the Fremont Weir, he said. 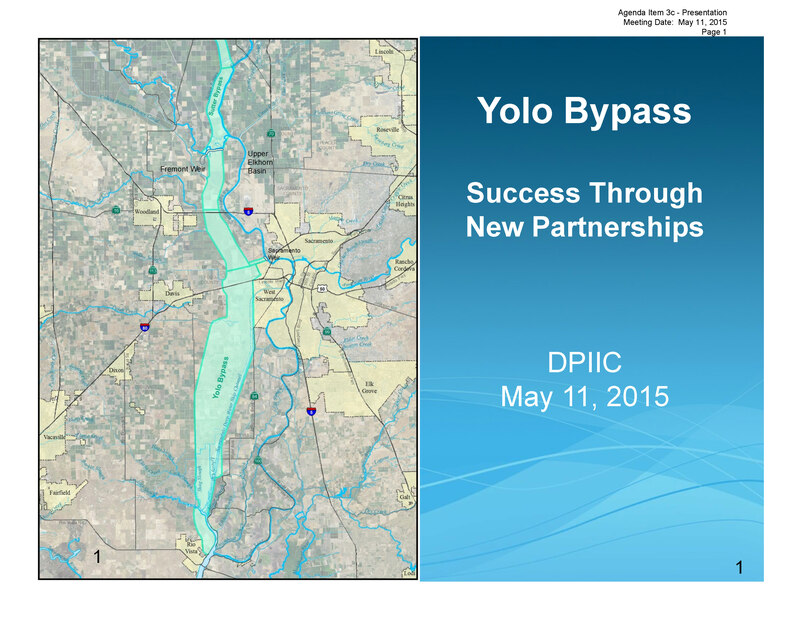 He noted that the county was a critical stakeholder because all of their actions are taking place within Yolo County, so they did a lot of outreach to county representatives, even having one on one meetings with supervisors to keep them informed. 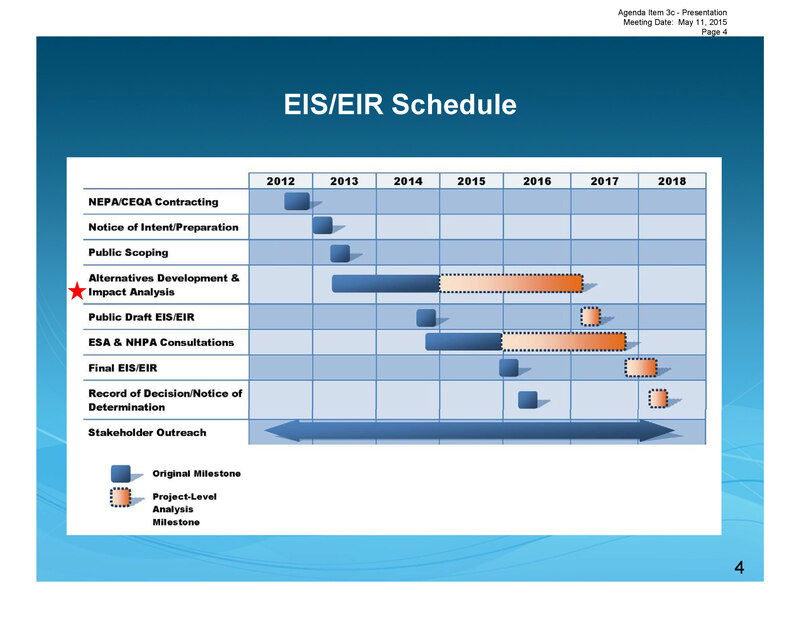 In November of 2014, the Bureau of Reclamation completed a value planning effort, which is a week-long process whereby local landowners, federal regulatory agencies, state agencies, and environmental groups take a look at the project. 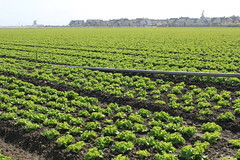 “It’s a process to make sure we’re really challenging our assumptions and are really developing well thought-out plans early on the planning process and not waiting until we get to the design and construction phase,” he said. 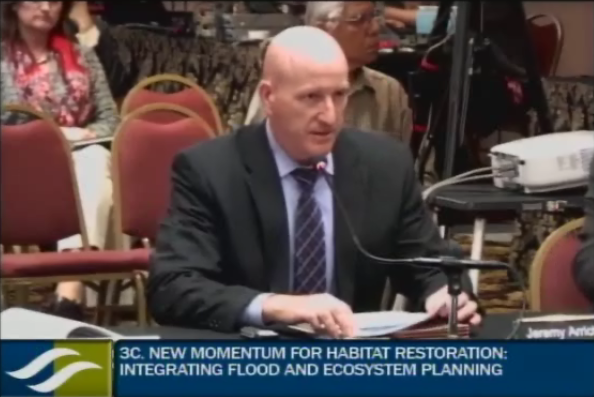 Mr. van Rihn said that Reclamation and the Yolo Project will continue to work in these working groups and really define what would integration look like to both the flood schedule and the Yolo project schedule, as well as to keep working with NMFS. 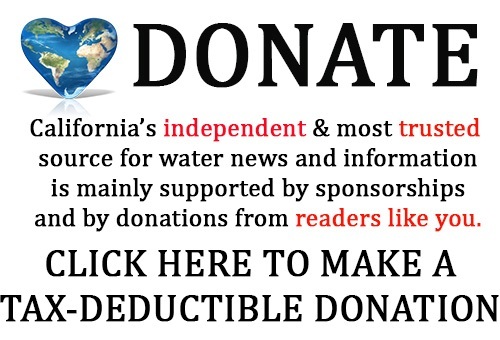 “The whole intent of this project is to meet the obligations in the biological opinion and the RPAs, so if integration isn’t going to get us to that objective of meeting the biological opinions, we need to sort of rethink of how we’re doing integration,” he said. 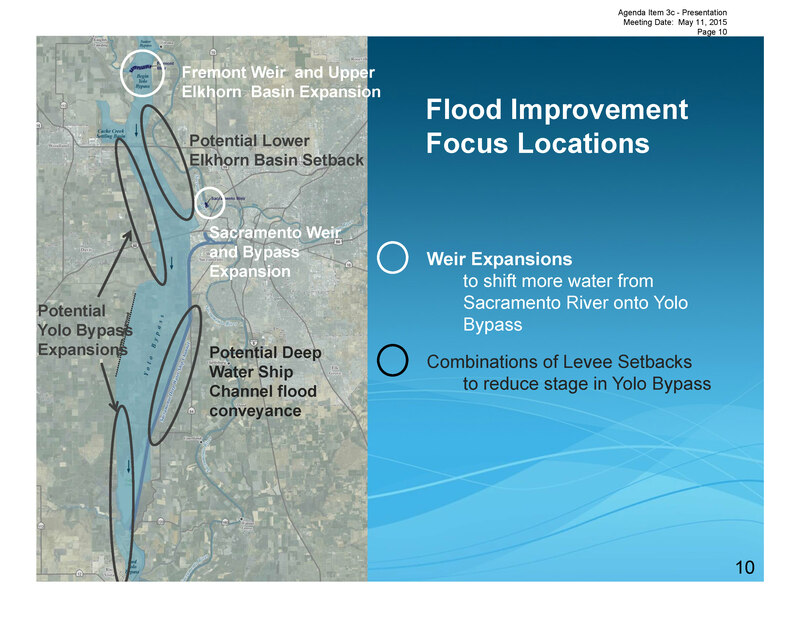 Mr. Arrich said they’ve also discussed their efforts with the Central Valley Flood Protection Board and the Army Corps of Engineers, as well as the local and regional flood planners. 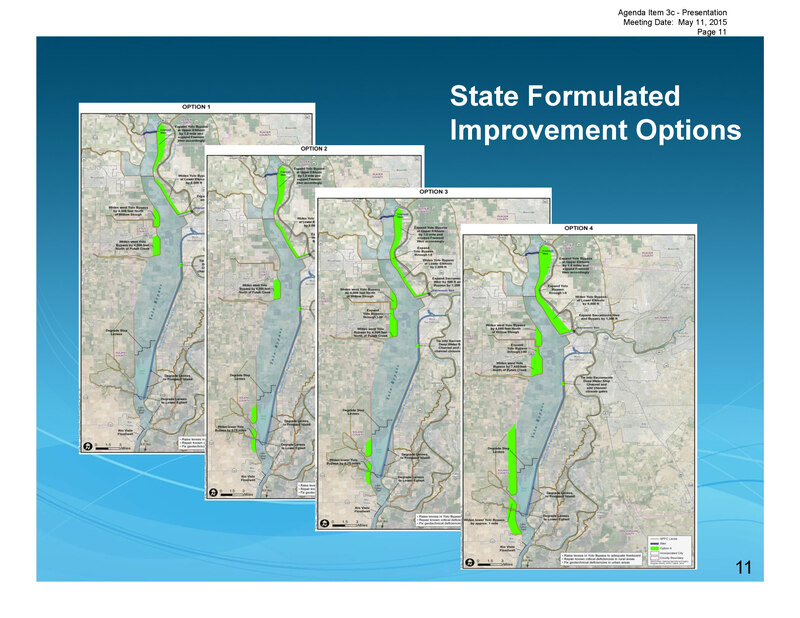 In terms of next steps, Mr. Arrich said they would be continuing to work on our feasibility study, integrating some ecosystem design features into the bypass expansion footprints, doing a cost analysis, and considering the feedback from the board and some of the public at a recent workshop. 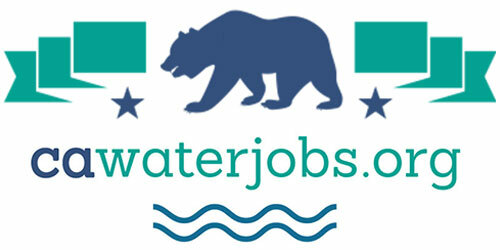 “Clearly there’s been fantastic work and a general willingness from the Bureau of Reclamation and other federal agencies to even consider other approaches to achieving these objectives, but it only really works if we can show that it works better, faster, and better ecological outcomes on the back end,” said Kristopher Tjernell.